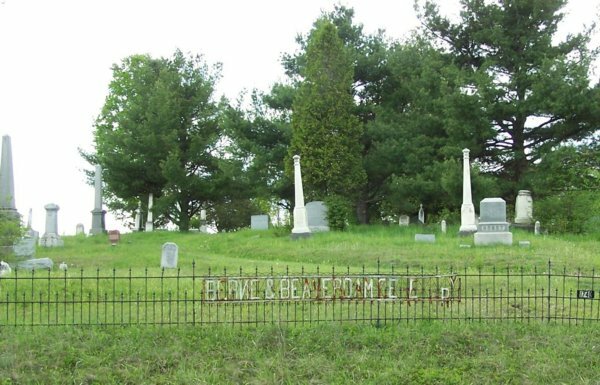 The Berne and Beaverdam Cemetery is on Helderberg Trail, one mile west of the hamlet of Berne on a knoll on the west. (Tax Map #78-2-29) Owner: First Berne Reformed Church, Heldeberg Trail, Berne, NY 12023. 60 by 360 feet surrounded by an iron fence. This is said to have been the site of the first Beaverdam Reformed Church, built in 1765, the earliest church in what is now the Town of Berne. The earliest readable stone is 1784. The massacred family of Johannes Dietz is said to have been buried there in 1781. Wm. Cockburn's 1787 survey map of the West Manor of Stephen Van Rnesselaer III shows the Reformed Church near the Foxenkill, on the site of the later Church farm. If so, there may have been an earlier cemetery beside the church. In the 19th Century it was often referred to as Pine Grove Cemetery. Records are maintained by the Berne Reformed Church. The records have not been made available to the Berne Historical Project, therefore the list of burials transcribed is incomplete. We need a volunteer to transcribe and photograph the stones or records and enter them onto the website. There is some evidence of vandalism and some fallen stones that are no longer readable.